USD 108 is looking for an energetic person to work as a Custodial Assistant for evening events including ball games. 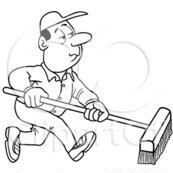 Duties include sweeping the gym floor, taking out trash and other custodial duties as needed during the event. Starting wage is $8.57 per hour. You receive FREE admission to all of the events you work. Contact Ken Cook at kcook@usd108.org or 785-325-2261 ext. 2 with questions. Applications are available on the USD 108 website and in the district and school offices.